Thistle Initiatives Limited has acquired Searchlight Insurance Training who is the UK’s leading provider of training services to the insurance services sector. Searchlight is widely recognised as the UK’s leading provider of both insurance technical and insurance management training and has over 50 experienced specialist trainers and consultants. Searchlight will continue to operate as a separate and distinct brand and continue to provide the same range of high-quality services via the existing highly experienced team. However, Thistle Initiatives will now have access to a broader portfolio of products and services via the new team. “We have been looking to expand into the training and competence sector and we were delighted to find such an expert specialist team at Searchlight. We have been truly impressed with the team at Searchlight led by Ian and Diane and we look forward to a great future together”. From both companies’ perspective, the primary driver is to leverage the very significant competencies and best practices across both organisations in order to add even greater value to our clients, provide access to new markets, products and innovative services whilst delivering truly excellent compliance advice, consultancy and support. 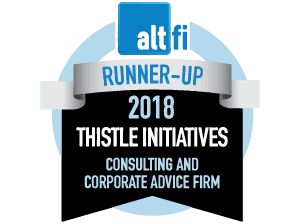 This acquisition by Thistle will take the combined number of consultants to over 100 in just over a 5 year period and we will continue to grow and expand through additional acquisitions over the next 12 months.